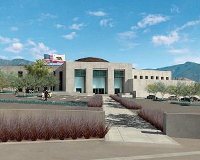 What: The public is invited to a groundbreaking ceremony for the new courthouse in Banning for the Superior Court of Riverside County, marking the start of construction of this long-awaited project. When: Tuesday, February 21, 2012, from 10:30 am to noon. Where: Banning City Council Chambers, 99 East Ramsey Street, Banning, California (map). Public parking is available at the lot across from the police station. The ceremony begins at the council chambers, and then the groundbreaking will take place at the new courthouse site on the northeast corner of the intersection of East Ramsey Street and Martin Street. The ceremony will be broadcast locally on Time Warner channel 10 and Verizon Fios channel 29 and streamed live from the City of Banning website. Who: The ceremony will include remarks by Presiding Judge Sherrill Ellsworth, Assistant Presiding Judge Mark Cope, and Court Executive Officer Sherri R. Carter of the Superior Court of Riverside County; Banning Mayor Don Robinson; Marion Ashley, Riverside County Board of Supervisors; and Ron Overholt, Interim Administrative Director of the Courts.